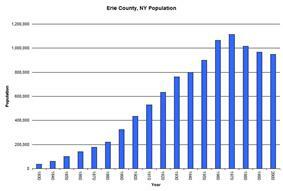 Erie County is a county located in the U.S. state of New York. As of the 2010 census, the population was 919,040. The county seat is Buffalo. The county's name comes from Lake Erie, which in turn comes from the Erie tribe of Native Americans who lived south and east of the lake before 1654. Its Canadian border is the province of Ontario. 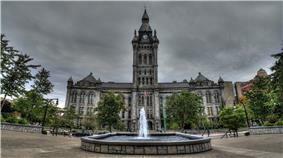 Erie County is part of the Buffalo-Cheektowaga-Niagara Falls Metropolitan Statistical Area. The southern part of the county is known as the Southtowns. When counties were established in New York State in 1683 present-day Erie County was Indian territory and was not part of New York. Significant European settlement began ca. 1800 after the Holland Land Company extinguished Indian claims to the land, acquired the title to eight western-most counties of Western New York, surveyed their holdings, established towns, and began selling lots. At this time, all of Western New York was part of Ontario County. In 1802, Genesee County was created out of Ontario County. In 1808, Niagara County was created out of Genesee County. 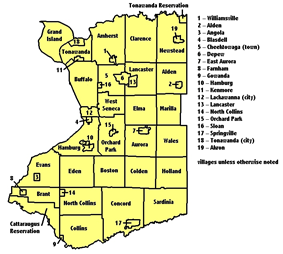 In 1821, Erie County was created out of Niagara County, encompassing all of the land between Tonawanda Creek and Cattaraugus Creek. The first towns formed in present-day Erie County were the Town of Clarence and the Town of Willink. Clarence comprised the northern portion of Erie county, and Willink the southern part. Clarence still exists as a town, but Willink was quickly subdivided completely into other towns. 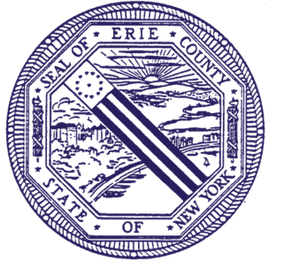 When Erie County was established in 1821, it consisted of the towns of Amherst, Aurora, Boston, Clarence, Collins, Concord, Eden, Evans, Hamburg, Holland, Sardinia, and Wales. 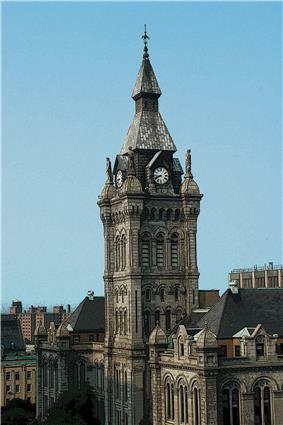 The county has a number of properties on the National Register of Historic Places listings in Erie County, New York. In 1861, the hamlet of Town Line located in the Town of Lancaster, voted 85 to 40 to secede from the Union and join the Confederate States of America; it sent five soldiers for the Confederate Army, and did not officially rejoin the Union until January 1946. The Town Line Fire Department supports the slogan "Last of the Rebels" due to their Confederate ties. Erie County is in the western portion of upstate New York, bordering on the lake of the same name. It is the most populous county in upstate New York outside of the New York City metropolitan area. The county also lies on the international border between the United States and Canada, bordering the Province of Ontario. According to the U.S. Census Bureau, the county has a total area of 1,227 square miles (3,177.9 km2), of which 1,043 square miles (2,701.4 km2) is land and 183 square miles (474.0 km2) (14.89%) is water. The northern border of the county is Tonawanda Creek. Part of the southern border is Cattaraugus Creek. Other major streams include Buffalo Creek (Buffalo River), Cayuga Creek, Cazenovia Creek, Scajaquada Creek, Eighteen Mile Creek and Ellicott Creek. The county's northern half, including Buffalo and its suburbs, is relatively flat and rises gently up from the lake. The southern half, known as the Southtowns, is much hillier and is the northwesternmost foothills of the Appalachian Mountains. The Onondaga Escarpment runs through the northern part of Erie County. As of the census of 2010, there were 919,040 people residing in the county. The population density was 910 people per square mile (351/km²). There were 415,868 housing units at an average density of 398 per square mile (154/km²). The racial makeup of the county was 82.18% White, 13.00% Black or African American, 0.61% Native American, 1.46% Asian, 0.02% Pacific Islander, 1.42% from other races, and 1.31% from two or more races. 3.27% of the population were Hispanic or Latino of any race. 19.6% were of German, 17.2% Polish, 14.9% Italian, 11.7% Irish and 5.0% English ancestry according to Census 2000. 91.1% spoke English, 3.0% Spanish and 1.6% Polish as their first language. There were 380,873 households out of which 29.60% had children under the age of 18 living with them, 46.50% were married couples living together, 13.70% had a female householder with no husband present, and 36.10% were non-families. 30.50% of all households were made up of individuals and 12.50% had someone living alone who was 65 years of age or older. The average household size was 2.41 and the average family size was 3.04. In the county the population was spread out with 24.30% under the age of 18, 8.70% from 18 to 24, 28.40% from 25 to 44, 22.70% from 45 to 64, and 15.90% who were 65 years of age or older. The median age was 38 years. For every 100 females there were 91.60 males. For every 100 females age 18 and over, there were 87.80 males. The median income for a household in the county was $38,567, and the median income for a family was $49,490. Males had a median income of $38,703 versus $26,510 for females. The per capita income for the county was $20,357. About 9.20% of families and 12.20% of the population were below the poverty line, including 17.30% of those under age 18 and 7.80% of those age 65 or over. label in parentheses refers to legal municipal designation. Amherst State Park, Village of Williamsville. Beaver Island State Park, Grand Island. Buckhorn Island State Park, Grand Island. Evangola State Park, Towns of Brant and Evans. Great Baehre Swamp, NY state wetland in the Town of Amherst. Knox Farm State Park, Town of East Aurora. Reinstein Woods Nature Preserve in the Town of Cheektowaga. Tillman Road Wildlife Management Area, Town of Clarence. Woodlawn Beach State Park, Town of Hamburg. Erie County is home to the Buffalo Bills football team, the Buffalo Sabres hockey team, the Buffalo Bandits lacrosse team, and the Buffalo Bisons minor league baseball team. The city also features a zoo, a botanical garden, a science museum, an historical museum, and the famous Albright-Knox Art Gallery. The Erie County Fair held every August in the Town of Hamburg, is one of the largest county fairs in the country. Plans to merge Erie County with the City of Buffalo have been suggested, which proponents say would eliminate much of the extensive bureaucracy and political and municipal subdivisions among the various towns, cities, and villages in the county. The result would be a consolidated city-county controlled by a single government, effectively making Buffalo's borders and population contiguous with Erie County's. These plans have proven very controversial; opposition has come from residents of the rural villages on the borders of Erie County, who feel the plan would not benefit them, and the suburbs, which want to avoid the financial troubles of Buffalo and Erie County while simultaneously benefiting from the amenities of close proximity to a large population base. The county legislature has 11 members. There are five Democrats, six Republicans. Many educational institutions include: Bryant and Stratton, Buffalo State College, Canisius College, Daemen College, D'Youville College, Erie Community College, Hilbert College, Houghton College, Medaille College, Trocaire College, University at Buffalo, and Villa Maria College. Heritage parks are the four original county parks. These parks are superb examples of integrated sites with significant scenic, natural and historic significance. Each of the parks has unique, man-made structures of unmatched historical character and beauty, constructed as part of the WPA movement. Waterfront parks are key elements of the vounty parks system, and include the significant sites along the county’s shoreline and linear parcels/recreational trail systems. The primary purpose of these sites is for conservation of the natural environment, and nature-based outdoor recreation activities, and the lands are to generally remain in a natural state in perpetuity. Special purpose parks are parks with unique characteristics, that fulfill a specific function within the recreation delivery system. Forest management areas are the former forest lots consisting primarily of plantation forests. Limited recreation potential in the form of trails or education on resource management is recognized for these lands, along with the potential for commercial resource management activities. ^ a b Smyczynski, Christine A. (2005). "Southern Erie County - "The Southtowns"". Western New York: From Niagara Falls and Southern Ontario to the Western Edge of the Finger Lakes. The Countryman Press. p. 136. ^ The Burned-Over District: Evolution of County Boundaries. Oliver Cowdery Home Page, accessed 7 December 2008. ^ "U.S. Decennial Census". Census.gov. Retrieved October 11, 2013. ^ Hansen, Robert (July 2005). "Research Brief:County Government Structure Update (vol. 3, no. 1)". National Association of Counties. Archived from the original on 2007-10-09. Retrieved 2007-11-12. ^ Erie County Parks System Master Plan, 2004. "Erie County School Districts 2003-2004". New York State Education Department. Retrieved 2007-11-12.